Good. This is a nice book with no writing or highlighting. We are real people in a real bookstore, contact us with any questions (preferrably about books). Fair. 0446675504 **PLEASE NOTE** This book is in poor cosmetic condition. There may be heavier water damage/Wear & Tear/Heavier writing/highlighting. **Ask for photos before buying. We do not mind letting you see before your purchase**. Book will work for the semester, but is cosmetically worn-out. Regardless of title, CD/DVD/Access Codes or Supplemental Materials are not guaranteed. Since I have become interested in Climate change and the crises that are occuring on our planet, someone recommended this book to me. They were not wrong. I loved the book. It gave me a lot of insights about where we are headed - hopefully not to the possible situation in this book - but still the scenario is not far-fetched. It is a good story with lots of vauable insight about how changes happens gradually - until we are living under much different conditions than we ever anticipated. The main character, and the allies she picks up along the way, are very believable - and you come to feel as if you know them. It is also an alarming look at the way we ccould possibly be living in the very near future. Stupendous. 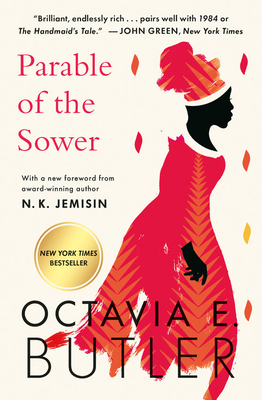 As the world cycles down into James Kunstler's "The Long Emergency," it will--I'm heartily convinced--evince the peak-oil-made-manifest, climate-change-made-unmanagable world of Octavia E. Butler's "The Parable of the Sower." This world is not far removed from our own. A pin-prick here; a flight of factual fancy there; and we are living it. Our world is coming to a head. And Octavia E. Butler nails it on the head. Human greed, apathy, and ignorance have brought us to this heady shore. The long emergency has finally come. The Parable of the Sower is coming... And twilight follows.